The last common ancestor of today’s apes and humans lived about 18 million years ago. Humans and Pan (chimps and bonobos) diverged 5 to 8 million years ago. 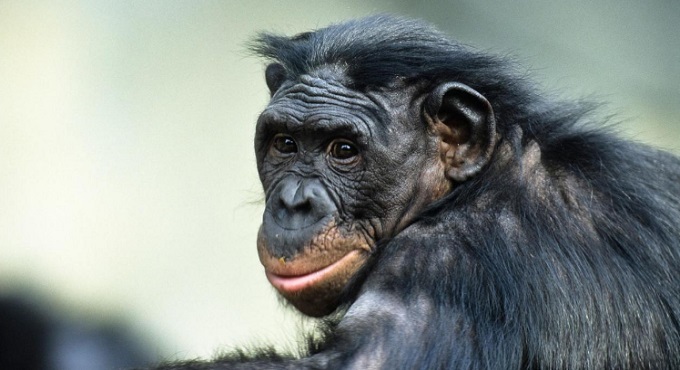 One explanation for the genetic separation between bonobos and chimpanzees is the formation of the Congo River about 1.5 million years ago which divided the population preventing contact. 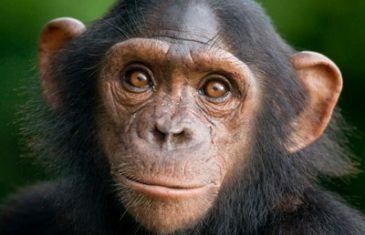 Bonobos, chimps and humans share 98% of genes. Hybrids between bonobos and chimps have occurred in captivity. All great apes (bonobos, chimpanzees and gorillas) can recognize themselves in the mirror. Bonobos (pan paniscus) was recognized in 1929 as a separate species from chimpanzees. Scientific Name: Pan paniscus. Pan from the Greek word for “all, whole, all inclusive, every”. Paniscus is a diminutive of Pan that originated from when the bonobo was originally known as the “pygmy chimpanzee”. 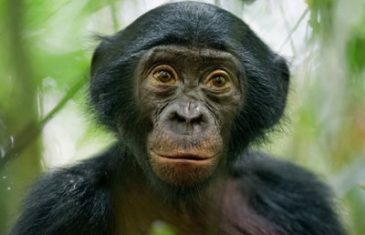 Common Name: Gracile chimpanzee; Bonobo, from the town of Bolobo near the Zaire River. Formerly known as Pygmi Chimpanzee or dwarf chimpanzee. The International Union for the Conservation of Nature (IUCN) recognizes the Pan paniscus as an Endangered species. The species is listed under Appendix I of the Convention on International Trade of Endangered Species of Fauna and Flora (CITES). Bonobos are listed under Class A of the African Convention on The Conservation of Nature and Natural Resources. It is illegal to kill, capture or trade bonobos and their body parts. The Zoological Society is conducting surveys to monitor its biodiversity and strengthen the Salonga National Park as well as providing literacy to locals in order to protect the bonobo. Bonobos are found only in the Democratic Republic of Congo south of the Congo River. They have a smaller range than the common chimpanzee. It’s range is discontinuous and estimated at 193,051 sq miles (500,000 sq km). 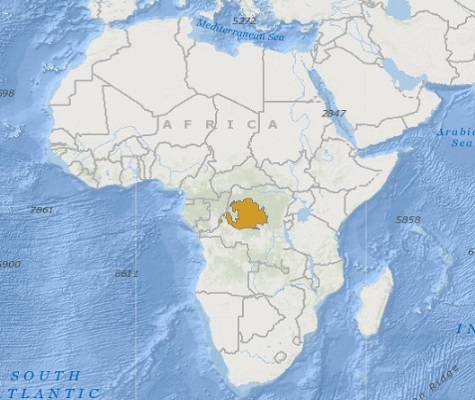 Population strongholds are located in the Luo Scientific Reserve, Lomako-Yokokala Faunal Reserve and the Kokolopori Bonobo Reserve in the north. In the south in the Salonga National Park. In the east in the Sankuru Natural Reserve and in the west in the Tumba-Lediima Natural Reserve. Its population is estimated between 29,500 to 50,000 individuals however only 30% of its range has been survey. Major threats to its population include habitat loss and degradation by human encroachment, hunting for bushmeat, disease and virus and lack of laws and regulations enforcement. Bonobo Distribution Map. Map adapted from IUCN. Bonobos are both terrestrial and arboreal. They are found in lowland rainforests, primary and secondary forests, savannas and swamp forests in the Congo Basin. They live at elevations from 984 to 2,297 feet (300 to 700 meters). Bonobos are not smaller than chimpanzees but their proportions are different. They have shorter arms and longer legs, they have more slender and gracile build than chimpanzees. This species has dark skin and long hair covering most of its body except for its hands, feet and mid face. The hair on their head looks as if it is parted and do not tend to go bald as they age as much as chimpanzees. Bonobos walk on all fours but sometimes they walk bipedally. They are known as “knuckle walkers” because they walk on the knuckles of their hands. Average height for males is 3.9 feet (119 cm) while females have an average height of 3.6 (111 cm). Males are about 30% heavier than females with a weight ranging from 81.6 to 134.5 lb (37 to 61 kg) and females from 59.5 to 83.8 (27 to 38 kg). Bonobos are highly social animals exhibiting a fission-fusion behavior in which the size of the group varies according to activity. An aggregation will split during the day to look for food and at night they get together to sleep. Communities have from 30 to 80 individuals. Bonobos are diurnal, they are most active during the day. They spend their time resting, looking for food, eating, traveling and grooming. Young females leave their birth group and settle in another group. Males stay and procreate in their birth group. Adult bonobos sometimes share a nest at night, this is unique among African apes. Like all apes they build a fresh nest every night. Bonobos comunicate by making sounds, gestures and facial expressions. Bonobos are polyngynandrous, they have many sexual partners. There is no mating season. Sexual maturity is reached at 13 to 15 years of age. Gestation lasts about 8 months. Females produce one offspring every 4 to 5 years this is due to lack of ovulation due to lactation. Infants are nursed by their mothers for the first 4 years. Bonobos are omnivorous. About 57% of their diet consists on fruits, the rest is a combination of leaves, bark, eggs, honey, bees, small vertebrates and invertebrates. In the wild bonobos are expected to live an average of 40 years while in captivity up to 55 years.